A camera strap is one of those accessories which in the beginning of your photography journey feels like anything will do the job. Many cameras come with an included strap, but your needs will start to become more specific with experience. For instance, a camera strap may need to be longer than what you have, a quick release, more support and the list goes on. Peak Design camera straps have been around for some time, providing support for many a heavy, expensive camera. The strap has been given some major upgrades which will make it even more appealing than the original. Here we will check out if the new version is worth buying over the original and how it compares to the rest of the market. The new version of the Peak Design Leash is now available in both black and Ash Grey and covers the main wants of a camera strap with quick release mechanisms, very lightweight and very easy to pack away. The focus here is on lightweight and portability. The strap is not very wide and neither is it padded, so it’s going to be best used with smaller sized cameras, especially over a long period of time. This doesn’t mean that it can’t carry a fully ladened DSLR, it just means that the comfort factor is cut the heavier the equipment it has to carry. The good news is if you need something wider or more padded, Peak Design have other straps in the range, which may fit the bill. The original version of the leash had adjustment only on one side of the strap, no Anchor Mount and the adjustment buckle was made of plastic. The plastic version worked fine, but it doesn’t feel as robust as a metal version. The additional anchor on the first version has been left out, but you can always use one of the spare anchors that come with the Leash on the new version. Visually there doesn’t seem to be much difference between the two versions, apart from the additional design features of the new edition. One of the unique features of the Peak Design Leash is the Anchor Mount which attaches to the tripod mount with a small metal plate. This in turn is linked to the quick-release Anchor part of the strap for quick release. 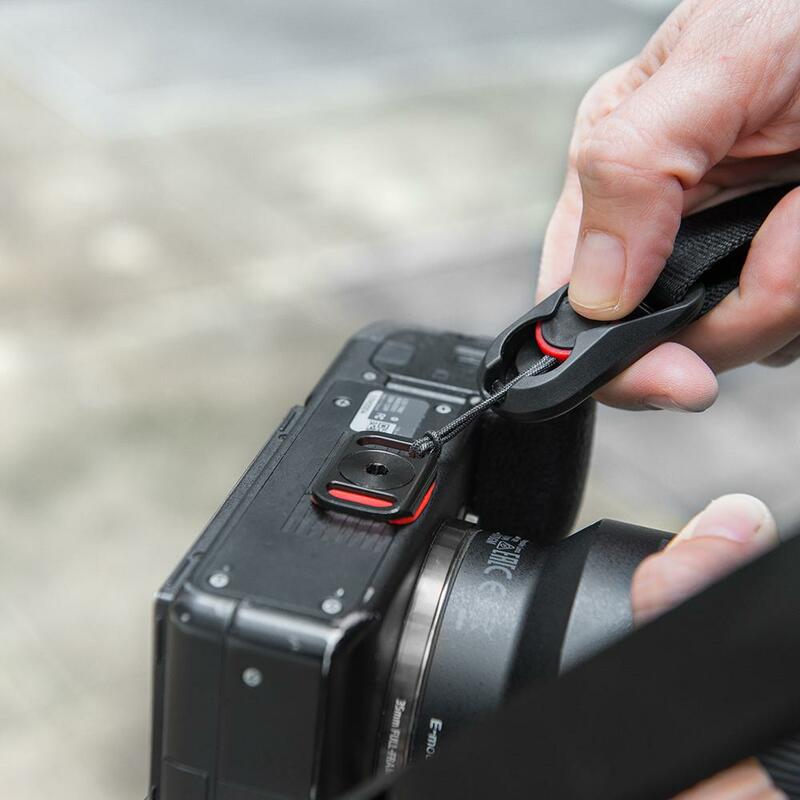 The advantage of having one end of the strap connected to the bottom of your camera and one as normal attached to the side means that a camera automatically points downwards when it is being carried. This points the camera’s lens out of harm’s way when it is carried around. If you like to have your camera slung around your hip on the strap, the lens points down and the whole unit feels like it sits against your body much more comfortably than before. The Anchor Mount in itself is a great accessory and a simple, but very effective solution. Adjusting the strap length can be done from either end of the Peak Design Leash. One end of the strap is to adjust the general length, while the other end is used to quickly adjust with an adjustment buckle whenever needed. Pulling the buckle forwards to adjust isn’t the most obvious way, but once you get used to it is very effective. The buckle is also very lightweight, in keeping with the rest of the Leash. It’s also very robust and locks in place with no movement. Exactly what you need when you’re slinging a camera around all day. The Anchor system is one of the great features on the Leash, allowing quick release, but still feeling robust. Press the button and the strap will easily release from its anchor points. Once locked in place though, everything feels very robust connected as solidly as possible. The advantage of having this type of anchor system is that you can have them attached to a bunch of cameras and only carry around one strap to fit everything at a moments notice. Convenience and ease of use is always a great idea. If you already own the original, you may be in luck with buying the additional features on their own as the Anchor mount can be bought from the Peak design store for $10. The Anchors on the new version of the Leash have been upgraded to thinner cords and a slight design change of the logo. The thinner cord is to fit through the small eyelets of lighter weight cameras, but is still rated at the same breaking strain of the original 200lbs. These can also be bought from the Peak design store for $10. The Peak Design Leash will appeal to those where every ounce of weight matters and for people who own lightweight cameras. The new version is definitely an improvement on the original with the dual adjusters and lower profile Anchor Mount. Attaching one end of a strap to the bottom of the camera is definitely the right way to go and I would say buying the Anchor mount for your own strap is a good idea as long as your own strap clips on fine. The Leash won’t be a solution for carrying round a heavyweight DSLR all day long, but in fairness the strap isn’t designed to do so. Peak Design have other straps in their lineup if you need extra width and padding, such as the Slide and the Slide Lite. As an extremely lightweight solution where weight matters, the Leash could just be the answer especially for smaller cameras, but here’s the caveat. Ultra weight saving may not be the top of everybody’s list while padding and support, along with quick releases mechanisms may be. Even when weight saving is an issue, I prefer as much padding and width in a camera strap as possible. Even with a lightweight camera, having something hanging round your shoulder all day long starts to take its toll, so for my needs the wider the better. However, if you are okay with the width of the Leash, this camera strap could last you a lifetime.